Gtmhub uses role-based access control to determine the level of access for all users. There are 2 default roles, Admin and User. Gtmhub uses role-based access control to determine the different level of user permissions. There are 3 default roles in each Gtmhub account - Admin, Hcm(HR) and User. The Admin role has access to view and manage all parts of Gtmhub account which includes, inviting users, creating and managing roles, teams, integrations, etc. 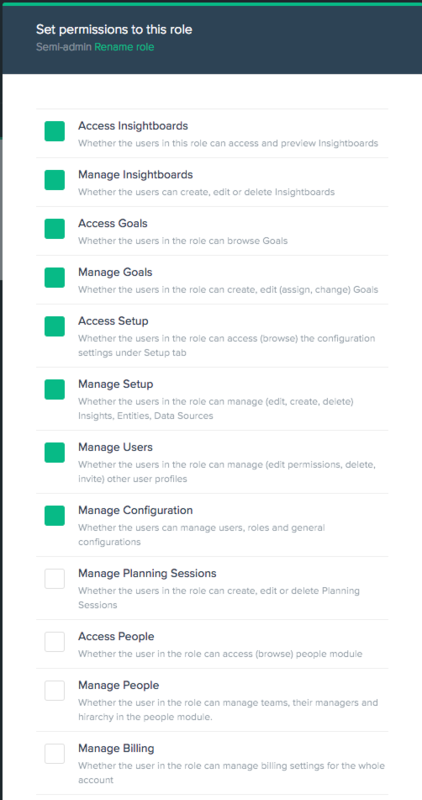 The User role on the other hand has a more limited set of permissions - it can view and manage objectives and insight boards and view the People module. Where Hcm has the same permission level as Users but some additional options are added so they this role can also manage the People module. By default each new user invited to a Gtmhub account will be assigned to the User role. If you need to provide more limited access to users, for example to have users that can only view Objectives but not manage/update them you can create a custom role and provide it the necessary set of permissions. Go to Settings (the gear) > Users and click the Manage roles button. You will see a screen with the built-in and custom roles. Click on Add new role and give your role a name. Then you can define the access level for that role. Select the necessary permissions and now you can save your changes. You can assign roles to users either individually or in bulk. To set a role for user go to Settings (the gear) > Users find the user you want to set a role for and choose the appropriate role in the User role section of the user's details view.